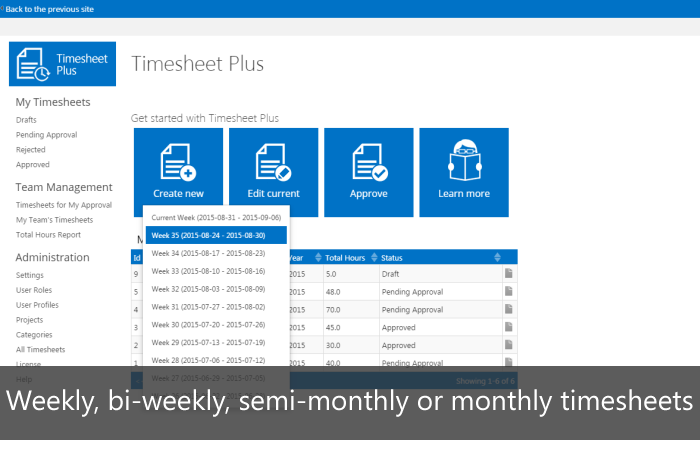 TimeSheet Plus is Sharepoint-based time and cost tracking software that automates the collection, approval, and reporting of employee work. 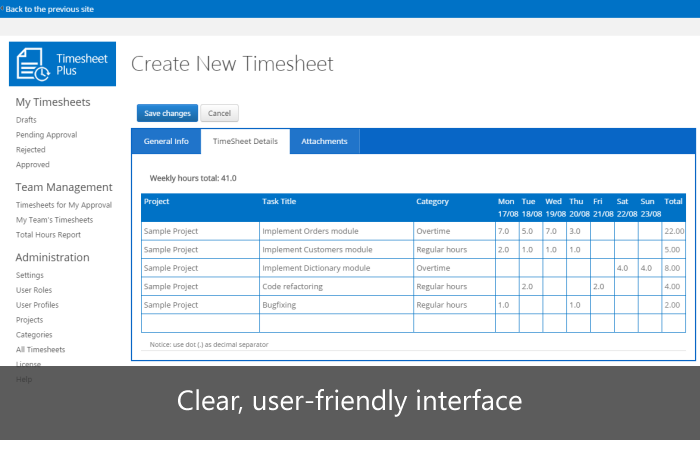 A user-friendly interface allows employees to conveniently track regular work hours, break time or overtime. The TimeSheet Plus workflow consists of four states: Pending Approval, Approved, Rejected and Cancelled. Please see below step by step guide to completing the approval process. 1. A user creates a new timesheet. 2. The user submits the timesheet for approval ("Send to approve" button). 3. 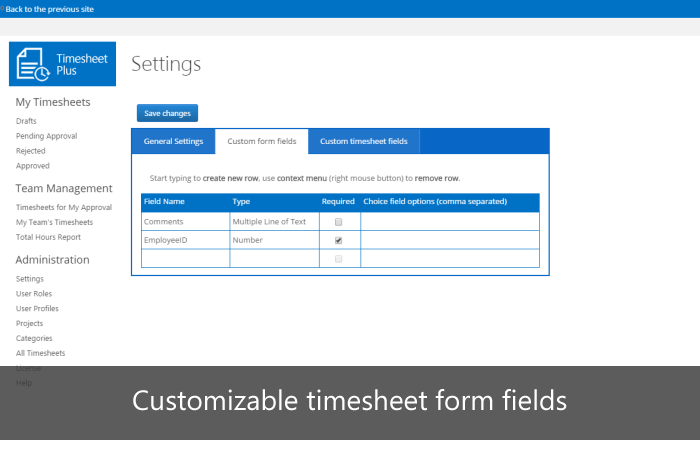 Before timesheet is approved by an approver, the user can make changes to the timesheet. 4. The approver(s) receives an email notification of the request. 5. The approver(s) approves or declines the approval request. 6. The user receives an email notification of request status (approved or rejected). 7. If the approver(s) approves the request, the process is completed. 8. If the approver(s) rejects the request, the user must edit and resubmit the request, until the approver(s) gives final approval. When you enable integration module, requests are automatically exported to native SharePoint list, enabling to leverage the full potential of SharePoint. 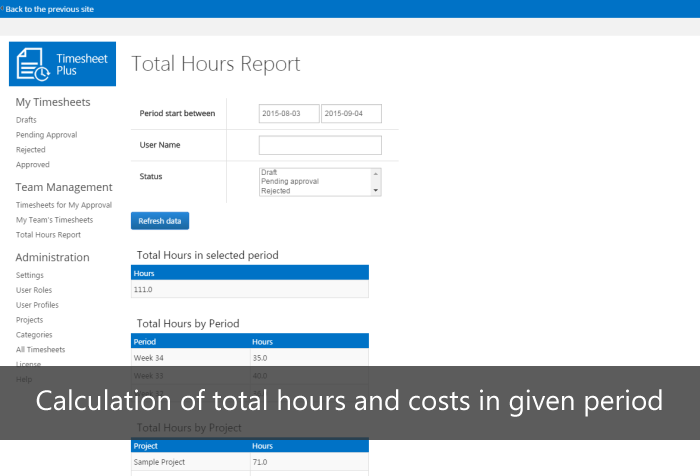 Sharepoint list can be integrated with many systems by using Microsoft Flow, used as data source for Power BI (reporting services) or displayed on different site via Web Part. Click here for more information. 2. Assign user roles: Manager and Administrator (section Administration->User Roles ). There is no need to assign regular User role, because this role is given by default -every user with access to the Sharepoint parent site (where the app is installed) also has access to this app as regular user. 1. Click "Create new" tile on the main page and submit request. Please read the below Product FAQ and General Troubleshooting FAQ before sending email with an technical question. * - Contact with us before purchase to receive promo codes. Where app data is stored? App is 100% SharePoint-hosted - all data is stored securely on the customer's SharePoint environment. App's data is never leaving your SharePoint env, we don't have access to your data and we never see it. How to pin app to the SharePoint menu? How to assign regular User role? There is no need to assign regular User role, because this role is given by default - every user with access to the SharePoint parent site (where the app is installed) also has access to this app as regular user. How to update SharePoint app? App update process is described here and also on our Technical FAQ, question "How to update SharePoint app?" SharePoint user is added to the User Information List after first login to the SharePoint Site. After first login, user will be visible in the user's drop-down list. How can I extend my trial period? We cannot extend trial period remotely, because app is SharePoint-hosted and our company doesn't have access to the customer's SharePoint env., however you can uninstall an app and install it again to "reset" 14-day period. (this operation removes all app data and configuration). Flextime is a flexible hours schedule that allows workers to alter workday start and finish times. 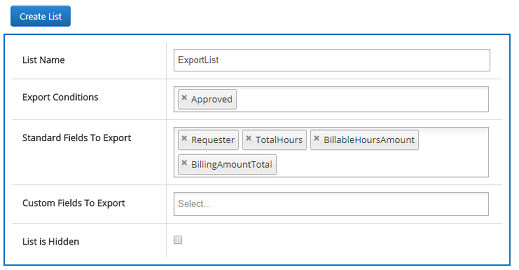 How to enable billing options? How to import users from Excel? 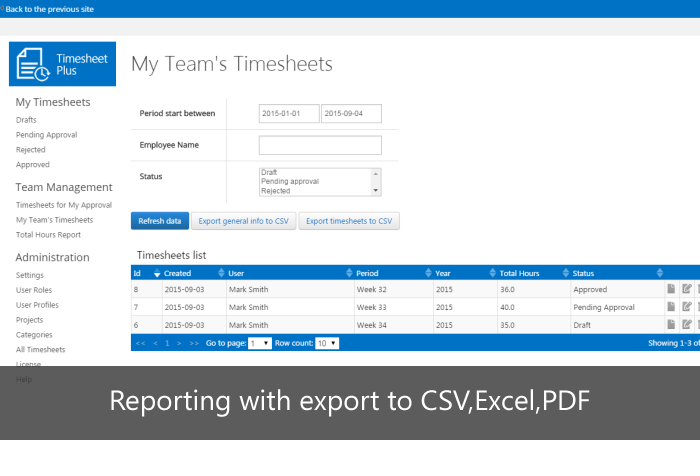 Timesheet import from MS Excel is not supported in the current app version. How to export data to CSV/Excel? How integrate with 3rd party systems? You can enable integrations features and use free quota on Microsoft Flow to integrate with 3rd party systems. Let say that you would like to export total working hours and billing amount to the external system (i.e. Slack,Oracle,SQL Server etc) when request has been approved. How to upload own logo?